We're Getting Closer to a Release of Stephen King's CELL! 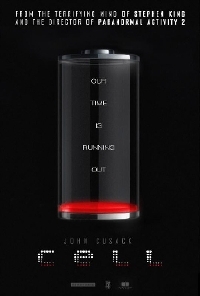 Saban Films just announced they've acquired the US distribution rights to the post-apocalyptic horror film Cell starring John Cusack, Samuel L. Jackson and Isabelle Fuhrman (Orphan, The Hunger Games). That means the film will see some kind of release (hopefully) in 2016. Cell was fully financed by Benaroya Pictures and produced by Benaroya Pictures and The Genre Company. Jonathan Saba and Ness Saban negotiated the deal on behalf of Saban Films, and Ben Weiss of Paradigm, Ben Kramer and Nick Ogiony of CAA, and Joseph Lanius of International Film Trust on behalf of the producers. Enjoyed the book until the part where the "zombies" started levitating. Hope they leave that out of the movie. This sounds good. This is officially on my radar. What an original idea! Why hasn't anyone done this before? For better or worse, Cell was *not* a sterotypical zombie novel. Who knows what path the movie took. I was thinking of the 'mystery signal makes folks go nuts' trope. What? Like David Bruckner's The Signal, or Pontypool? There have been a few. I'm not sure about this movie. I was looking forward to Cell when it first came out. I liked the book up to the ending. I might give this a look I might not. Find a way to fix this.